Hanoi’s streets (in 2007, above) are now full of motorcycles and scooters, and shop shelves are no longer bare. 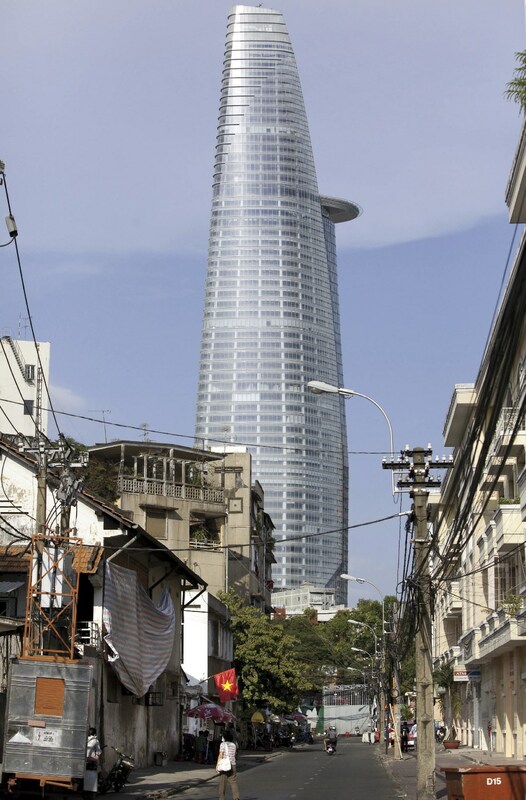 Complete with heliport, the Bitexco Tower rises over traditional Ho Chi Minh City. The Fulbright School’s modest plaque belies its large impact. Tran Ngoc Trung Nhan, a Fulbright student who works for the My Tho municipal government (in the Mekong Delta), navigates the boundaries between private investment and public land ownership. My Tho’s upgraded retail market reflects private investment. Nguyen Xuan Thanh, M.P.A. ’06, developed the Fulbright School’s degree program—and is now its director. 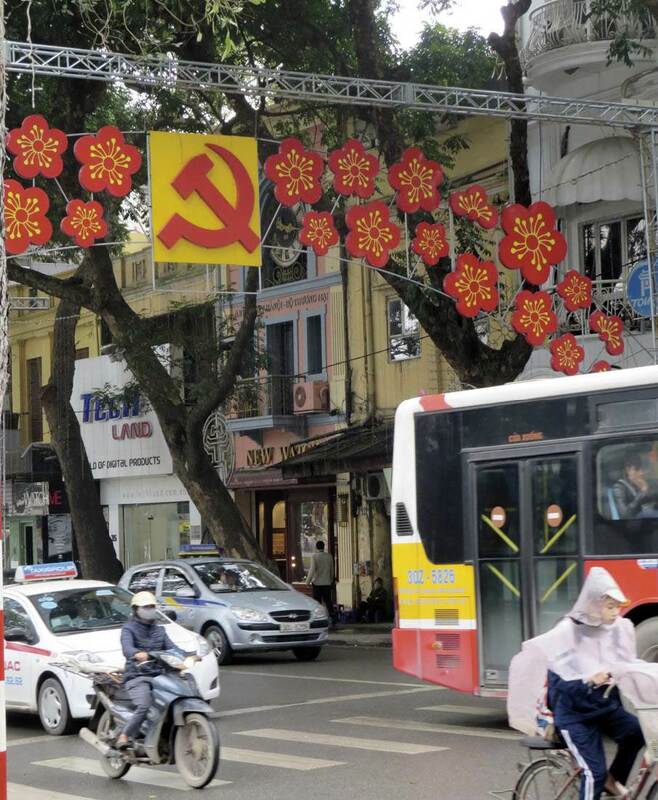 Lest anyone forget, Vietnam remains a Communist Party state, as a street decoration in central Hanoi suggests. For all its gains during the past 25 years, much of Vietnam’s economy remains traditional, as in My Tho’s market street (shown here) and outside the major cities. 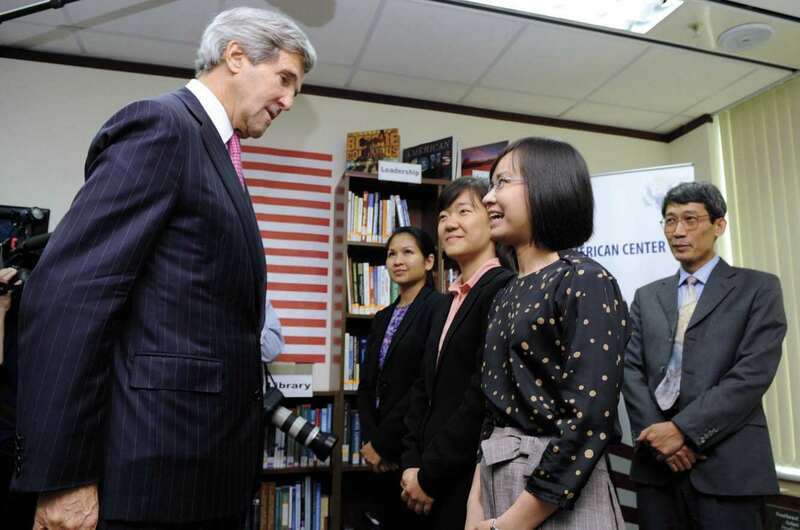 During his first visit to Vietnam as secretary of state, John Kerry met with Fulbright alumnae Tran Thuy Giang (at rear, of Tri Viet Consulting and Investment) and Dang Thi Manh (foreground, of Procter & Gamble Vietnam). Faculty members present included Le Thi Quynh Tram, M.P.A. ’13 (center), and Pham Duy Nghia, a former Harvard Law School fellow (far right). On a recent Monday morning, during a class on global trade, the professor reviewed the effects of nations’ limits on such commerce: tariffs, quotas, and the “voluntary” restraints exporting countries impose on their shipments to eager customers (lest protected interests in the importing area wilt). His students, arrayed in a teaching amphitheater laid out like the classrooms at Harvard Business School (HBS)—complete with laminated placards bearing each student’s name, for identification during case discussions—closely followed his analysis of the costs accompanying each intervention in the market. They applied economic concepts taught in other courses (the marginal benefits and costs that shape demand and supply) to the problems of production and consumer welfare raised by the trade policies. But despite the similarity to teaching moments at Harvard, this one took place at the compact campus of the Fulbright Economics Teaching Program (FETP, commonly called the Fulbright School) , off a narrow, twisting alley in District 3, Ho Chi Minh City. The lecturer, James Riedel, Clayton professor of international economics at the Johns Hopkins School of Advanced International Studies , visiting for the semester, spoke in English, an exception among the otherwise indigenous faculty. He was fully translated into Vietnamese in real time, and the students’ texts were all in that language. The nearly five dozen students, admitted via a rigorous, merit-based competition, from provinces throughout Vietnam—unlike their country’s other institutions of higher education—were in the second term of their two-year master in public policy (M.P.P.) program, modeled on the degree offered by the Harvard Kennedy School (HKS). Perhaps it was awareness of their special status in this special school, Riedel said later, that made the students more focused about their work (no in-class e-mail trolling, no doodling) than any he has ever taught in the United States. Fulbright School is in its own words “a Vietnamese institution with international stakeholders, operated according to governance principles that are prerequisites for excellence: autonomy, meritocracy, accountability, and high standards.” The school, now in its twentieth year, is a partnership between the University of Economics, Ho Chi Minh City, and the HKS Vietnam Program  (within the Ash Center for Democratic Governance and Innovation ), funded principally by the U.S. Department of State bureau of educational and cultural affairs. By bringing economic and policy analysis to bear on Vietnam’s development challenges, the school has seeded a new group of leaders there—more than 1,000 alumni strong—in government, private and state-owned enterprises, finance, and academia nationwide: institutions very much in need of trained talent, in a country desperately short of it. Education is only the most visible element in a broader program of engagement that also includes research on Vietnam’s economic evolution and tough-minded policy dialogues with national leaders on the country’s real, difficult problems. The relationships built through the teaching, research, and policy discourse have also opened something of a pipeline for Vietnamese students to pursue their education at Harvard, on their way to positions of increasing responsibility in their nation’s government and business today. It would have been hard to envision any of this a quarter-century ago, when development advisers from Harvard, not knowing what to expect, first visited Hanoi. In early 1989, recalls Dwight H. Perkins , then director of the Harvard Institute for International Development (HIID, the University’s economic-advisory service until 2000), he and Vietnam Program director Thomas Vallely, M.P.A. ’83 , had to travel through Thailand. (Because the United States and Vietnam would not establish relations for six more years, the visitors had to pick up visas en route.) They knew that with the 1986 passing of the generation of leaders who had guided the country through 40 years of war to independence and united Communist government, Vietnam had embarked on doi moi, its term for economic “renovation,” but not soon enough. Inflation exceeded 400 percent annually. In the winter of 1987-1988, large numbers of the northern and central population suffered from acute food shortages. The upheaval in eastern Europe the next year, followed by progressive dissolution of the Soviet Union’s COMECON trading block, which had propped up Vietnam’s government and economy, exposed the country to outright crisis. The grievous wounds from the war with the United States hung over any possible cooperation and, Perkins says, “There were very few people we could talk to who knew anything about economics.” In one memorable case, he recalls foreign minister Nguyen Co Thach reading Paul Samuelson’s Economics textbook to learn about markets—anything to find a path from the prevailing ruins. That pragmatism proved decisive. Despite their fears about the lingering war legacy, the HIID team found themselves welcomed to explore Vietnam and study anything of economic importance (agricultural conditions and the factory sector were initial focal points), subject only to reporting their findings to the state planning commission. The early research, gathered into a Vietnamese-language volume titled In Search of the Dragon’s Trail, was published in 1994. Because HIID advisers were neither profit-seeking foreign investors nor aid agencies with a development agenda (Western aid arrived en masse later, after the U.S. embargo ended in mid decade), Perkins says, they got a hearing. “Does that mean they took our advice?” he asks. Not always. During this period, Perkins notes in his recent book, East Asian Development (Harvard) , Vietnam barely survived on the strength of two bits of fortunate timing. First, the decollectivization of agriculture (undoing the disruptive Communist design imposed on southern Vietnam and its fecund rice-growing Mekong Delta, following victory and reunification in 1975), combined with overdue changes in market pricing and exchange rates, led to a surge in output and resumption of exports. Second, following Soviet-era exploration, offshore oil production began—another source of urgently needed foreign exchange. 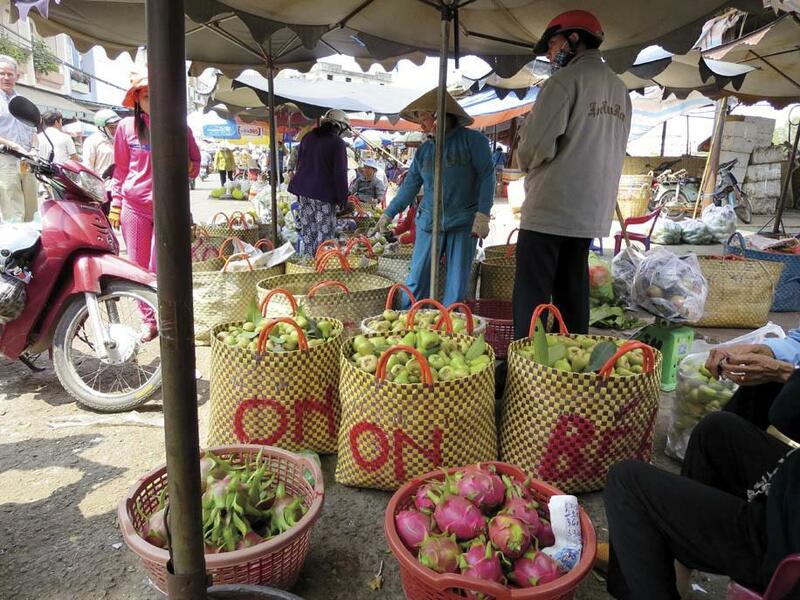 As doi moi accelerated from 1989 on, prices were freed and trade was liberalized. The all-encompassing party-led state made itself a somewhat smaller part of a larger economy. State-owned enterprises began to be weaned from subsidies and slimmed down (but, crucially for the future, not dismembered or privatized). 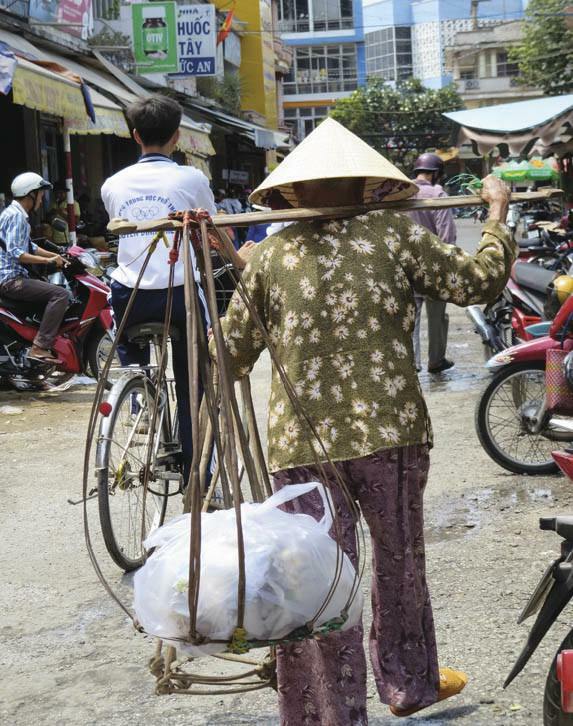 Vietnam embarked on two decades of nearly 6 percent annual growth in economic output per capita. What made a perhaps more lasting impression than that early research were the Vietnam Program’s associated educational efforts. In 1990 and 1991, Vallely and Dapice took state planners, economic ministers, and other high officials on eye-opening tours of Indonesia, South Korea, Taiwan, and Thailand, and to a retreat on Bali. (Alumni in local Harvard clubs helped arrange high-level meetings.) For many participants, this was their first visit to these fast-developing neighbors, and an initial chance to meet their counterparts responsible for inaugurating rapid growth and gains in their people’s standards of living. When the visitors saw something they liked, Perkins recalls, they were apt to ask, “How do we do this?” Dapice was on hand to explain the underlying economic principles: how to alleviate a fertilizer shortage not anticipated in the central plan, for instance, by trading for supplies from abroad and letting the price increase to attract sellers. The briefings, he recalls, ranged widely (extending to the role of education and the organization of modern society) and candidly explored questions of concern to the leaders reshaping a Communist country (how do money and power interact, and what about corruption?). Among the participants were a future governor of Vietnam’s central bank, and Phan Van Khai, who became prime ministerlater in the decade. In that work or other assignments, he may be able to draw on a new cohort of analysts. Taking note of the several FETP graduates who work in the agriculture ministry or allied institutions, Phat said, “They are outstanding, very useful in the way they analyze the situation and propose policy measures to deal with the problems”—and see to their implementation. For just as Phat pursued his studies in Cambridge, the Vietnam Program’s most unusual imprint on the country took shape. HIID typically established a presence in nations where its advisers worked, but in the early 1990s, before U.S.-Vietnam relations were normalized, this proved impossible to accommodate in Hanoi. As an alternative, in response to Vietnam’s need for basic economic literacy, the Harvard personnel conceived a residential training program. 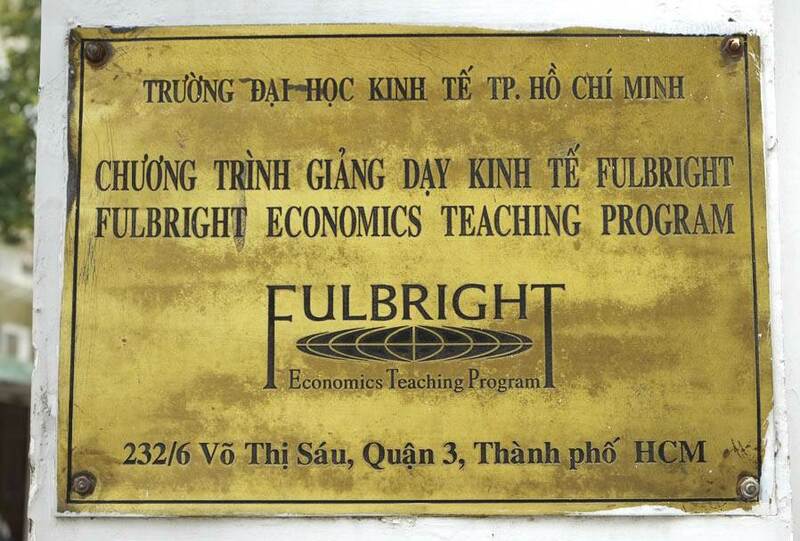 An academic partner was identified in the relatively unconstrained Ho Chi Minh City (think Shanghai, the more international, colonial trading outpost, versus Beijing, the ancient capital), and the Fulbright Economics Teaching Program opened in 1994. It began as a one-year certificate course in classical economics, modeled on the HKS curriculum. Candidates were screened by a standardized test and faculty reviews of written applications. In a country lacking an apex university that draws a national student body (like those in China and Japan, for instance), the Fulbright School aimed for candidates from provinces across Vietnam—particularly those less likely than elite urban students to have opportunities to study abroad. Senior faculty members were borrowed from around the world—among them Perkins, who taught a version of his Harvard course on Asian development for most of two early semesters, and Dapice, who was in the classroom at the beginning, middle, and end of each academic year. Lecturers and teaching assistants were appointed from local universities, with progressive efforts to develop an indigenous faculty. And from the outset, English lectures and course materials were translated into Vietnamese; they are now disseminated to all comers online , broadening the school’s educational impact nationwide (up to 100,000 filesare downloaded monthly). Absent any grand plan, the Vietnam Program had seeded a new institution. Perkins has direct experience of higher education’s crucial role in fostering development in Indonesia and South Korea. Twenty years on, he says, somewhat amazed, “The Fulbright School provides the best graduate-level training program in Vietnam in the social sciences.” Apart from engineering, he says, higher education there remains “pretty terrible”: overworked faculty members moonlight to make a living, never mind having time for research. In that context, even at its current scale, the Fulbright faculty (now writing their own teaching cases based on problems from Vietnam) and their students (now pursuing research for their theses in a full-fledged M.P.P. degree program) have come to have an outsized, and promising, impact on the country as a whole. 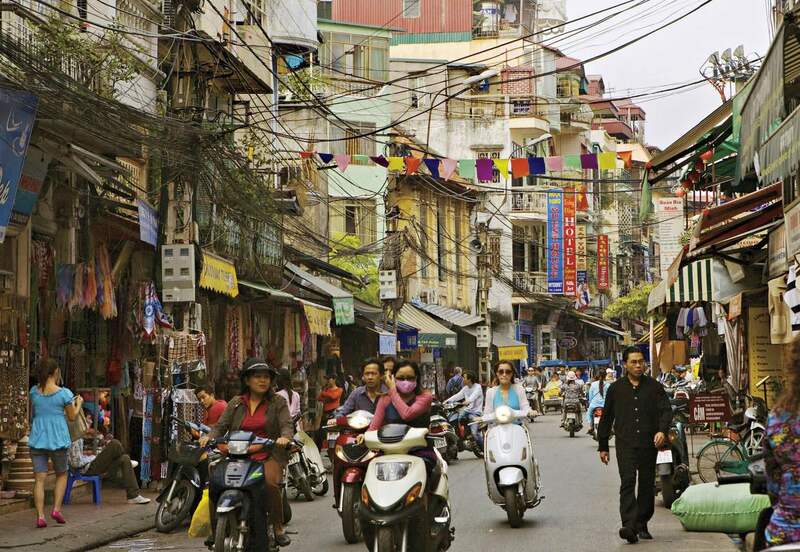 South of Ho Chi Minh City’s older core—its narrow streets abuzz with storefront pho shops and rivers of commuters astride motorcycles and scooters—the modern, European-feeling urban area of Phu My Hung (“Saigon South”) unfolds with wide boulevards, greenery, and new apartment buildings. Residential towers are under construction seemingly in every direction. This growth, anchored by an export-processing zone created in the mid 1990s by Ho Chi Minh City with initial investors from Taiwan, represents contemporary Vietnam: integrating with the global economy, supporting a rising middle class, and attracting the offices of international companies like Unilever that are eager to serve a nation of some 90 million people (ranked thirteenth worldwide). The core of My Tho is the very picture of modernity: clean streets, airy halls for visitors about to embark on Mekong River excursions, spruce government offices, and narrow, multistory residences rising on the tiny lots of the houses they replaced. 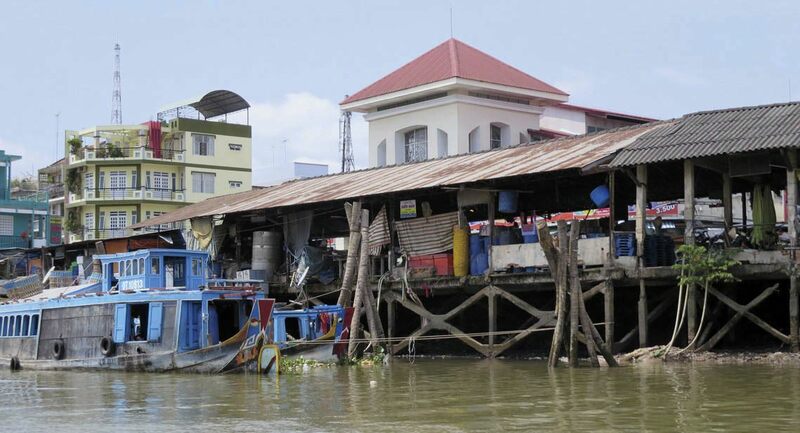 But at water’s edge, an older Vietnam prevails: stilt-supported structures of wood, brick, rough concrete, and corrugated-metal roof and wall panels: the homes of fishing families, potters, and others whose livelihood intertwines with the river daily. A wholesale farmers’ market—the conduit between the surrounding rural province and urban consumers—and a vast retail market (for foodstuffs, clothing, and household goods of every description), originally organized informally by growers and buyers, also abut the river. Tran Ngoc Trung Nhan negotiates the boundaries here between traditional and modernizing Vietnam, and between the state and private economy. In his work for the People’s Council Office and People’s Committee of My Tho (the municipal government) in trade promotion, he is responsible for attracting investment to modernize those markets, while the underlying land remains in public ownership. He guides visitors through the wholesale market that yields the sensations of rural Asia: roosters under wicker cages contemplating their fate, scarlet dragon fruits and bunches of green fingerling bananas on tarps, baskets and bagged bundles of produce bound for Ho Chi Minh City. But the pavement is uneven, the roof improvised in spots, and rotted produce tumbles down the bank to the water. Vendors’ rents don’t suffice to maintain what structure there is, nor support improvements for health, fire safety, or efficiency. 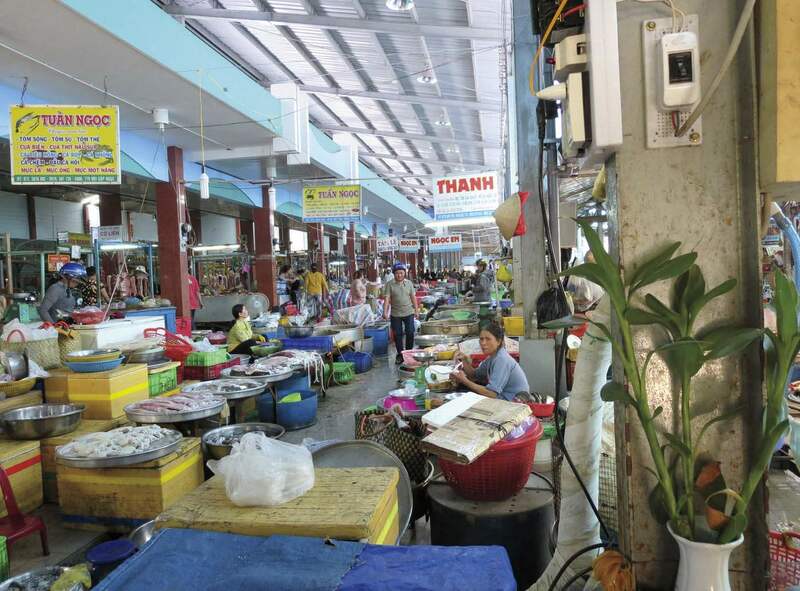 The retail market, in contrast, has a smooth concrete floor, running water and drainage (essential for the fresh-fish vendors), good lighting and ventilation, a sturdy new roof, and much-reduced threat of fire: all the fruits of private investment. Nhan trained as a construction engineer, and so had mastered the physical details of renovation. But he enrolled in the Fulbright program in 2012 to broaden his approach to the market modernization. He cites new skills in economic analysis, in assessing cost and benefit “to look for efficiency in an investment,” and in the legal aspects of the province’s oversight of development. For the market project, he has had to balance a long-term agreement for private investment with the enhanced facilities for the users—and the sixfold increase in merchants’ monthly rent (to $15 for a selling space three meters square). A workable path toward renewing the smaller wholesale market remains to be devised. His thesis, being supervised by Thanh, addresses this process and the trade-offs. More broadly, Nhan has seen to changes in the local and provincial review of residential building permits—sorting out problems he had not perceived before his studies. In Tien Giang, where farming and aquaculture still employ most of the population, the cumulative effect of such steps supports local ambitions to spur further investment and increase incomes. Nor does Nhan labor alone. Throughout the delta, other Fulbright School graduates are pursuing development and shaping Vietnam’s transition—and were eager to share news with fellow alumni at a luncheon in My Tho (for some, a couple of hours by car). Vo Thi Thu Huong is vice director of the Vietnam Chamber of Commerce and Industry in Can Tho, the delta’s principal city: an unexpected-sounding role in a Communist country, but, she explains, a public organization that shares business perspectives with the government. She is also vice general secretary of the Pangasius Association, representing growers of native catfish, a major aquacultural export (and the subject of trade disagreements with the United States). Tran Thanh Tung, an FETP student in 2002 and formerly the investment manager at a provincial industrial-zone authority, in 2009 became rector of Vinh Long Community College, itself evolving: formerly a vocational school, now a higher-level institution offering instruction in nine programs such as aquaculture and food processing. Enhancing its 5,000 tuition-paying students’ skills represents another element in the province’s larger plan to move upward economically. Essential though such steps are, recent experience has proved that realizing Vietnam’s potential is hardly guaranteed. As the country has grown and changed, so has the Fulbright School—in ways that have deepened the engagement of its faculty and of the Kennedy School’s Vietnam Program in addressing daunting challenges. Those challenges stem from myriad problems in the political economy. As Dwight Perkins writes, steps taken in 1989 to expose state-owned enterprises (SOEs) to competition and to reduce their subsidies seemed to indicate “a willingness to move rapidly and firmly on…reform more generally” (as in China), but that was not the case. Sales of oil and farm products, rapid gains in exports of shoes and garments assembled in foreign-owned factories, and widely available development aid following the normalization of U.S.-Vietnam relations all buffered deeper change. The Asian financial crisis late that decade slowed growth markedly, David Dapice says, and the state became “increasingly dirigiste” (controlling of the economy). Even so, private enterprises, newly liberalized in the new millennium, initially thrived, and a boom followed, with growth in gross domestic product reaching 8 percent from 2005 through 2007. But as Perkins writes, the SOEs, taking advantage of their “close relationship” with state banks and party leaders, indulged in profligate borrowing, expanding beyond their core businesses into real estate and other speculative activities and helping to drive inflation up to 23 percent in 2008. As policymakers sought to control the economy, private companies found it difficult to compete with the SOEs for credit and land and their growth was stunted. Although doi moi had stimulated agriculture, the uncertain status of land ownership has discouraged farmers from making long-term investments that would boost productivity. With the advent of the world financial crisis and recession, growth slowed to a pace well below the torrid rate China had sustained for three decades. Vietnam’s per-capita output had then reached only one-third of China’s, and only a tiny fraction of the levels enjoyed by Korea and Taiwan (and even trailing the less successful Thailand and Indonesia)—the very places Vietnam’s leaders had visited with wonder two decades earlier. It was in this context that two landmark changes in the Vietnam Program converged. 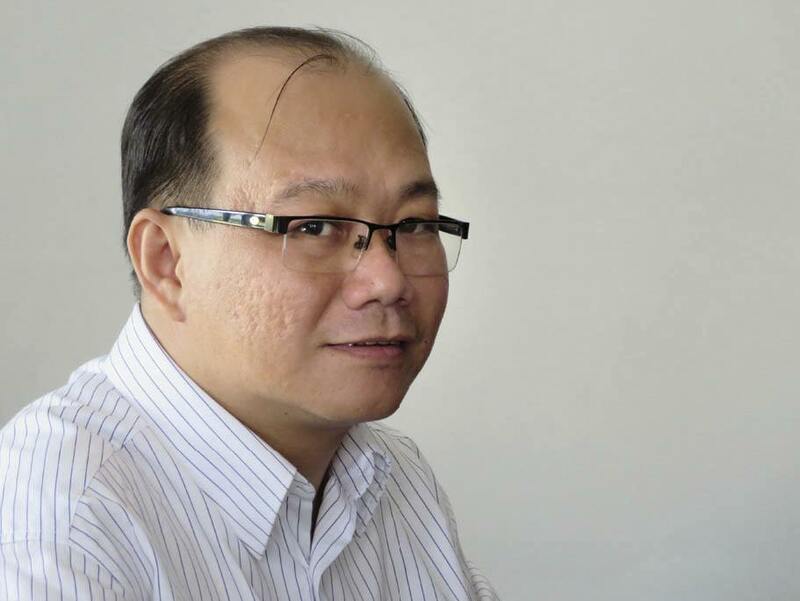 In Ho Chi Minh City, Nguyen Xuan Thanh , who initially worked for the school part-time as an interpreter and translator, and then as a tutor and co-instructor, joined the faculty full-time in 2002. Following his two years at the Kennedy School, where he added an M.P.A. to an earlier master’s degree, he returned to Vietnam to develop FETP’s own two-year master’s. In proposing the program to the Ministry of Education, he recalls, there was no field of study in “public policy,” so it took a couple of years of cultivation and explanation to get the discipline recognized, in 2008. That elevated the program from its prior certificate-granting status; created room for elective courses beyond the economics curriculum (which now extend to management, leadership, and, broadly, “law,” as a proxy for political science); and accelerated development of the indigenous faculty, and of their research for Vietnam-based teaching cases. The timing was fortuitous. During the same period, Prime Minister Nguyen Tan Dung asked the Vietnam Program to critique the country’s development strategy for the decade to come—in effect, updating the Dragon’s Trail research in an era of expanded global trade and supply chains, China’s furious growth, and more complex requirements for managing the domestic economy. The resulting paper, “Choosing Success” (available on the Ash Center’s website) , drew on work by Dapice, Perkins, and Daewoo professor of international affairs Anthony Saich, the Ash Center director; staff members including Ben Wilkinson ’98, based at FETP ; and Fulbright faculty members Thanh, Vu Thanh Tu Anh , and Huynh The Du . The paper pointed squarely at policymakers and the powerful interests who influenced them to support inefficient but well-connected SOEs—a strategy “no different from a soccer coach who starts his weakest players in the championship match.” To achieve their goals, Vietnam’s leaders would have to improve education, reform public finances, adopt corporate transparency, empower the central bank, and, generally, “eliminate delusional policies.” In comparing Vietnam to other Asian economies, the paper strongly suggested that making the right choices could lead to the results the leaders sought; their challenges lay not in ideology, but in sound governance conducted by a modern state. After “Choosing Success,” in fact, the government sought a regular channel for unfettered conversations about such questions. The resulting Vietnam Executive Leadership Program (VELP) , begun late that same year of 2008 and supported by the United Nations Development Programme, has brought senior government leaders (led by one of the deputy prime ministers) to the Kennedy School four times for week-long, confidential exchanges on globalization, Vietnam’s competitiveness, and its socioeconomic development. The thematic agenda for each dialogue—dedicated, Thanh says, to “contributing to the policy debate, so the government can make better policy”—is developed by FETP and Harvard personnel in consultation with Vietnamese officials. With the deepening of Vietnam’s economic problems and the strengthening of the faculty’s capabilities, those discussions have, in turn, only become more searching. The discussion paper for the VELP gathering in Cambridge last August  showcases that evolution. The lead authors are five Fulbright faculty members plus Wilkinson, followed by Perkins and Dapice. Their analysis progresses from probing problems and posing policies to critiquing the society’s basic rules. The paper first categorizes Vietnam’s recent economic strength (in attracting export-oriented foreign direct investment) and weaknesses (in all other sectors, from SOEs and weakly capitalized commercial banks with conflicted ownership to private businesses and agriculture). It then outlines broad choices and their likely result: managing fiscal policy and inflation, but eschewing basic reforms (3-4 percent growth); restructuring loss-ridden banks to improve lending to the private and agricultural sectors (5-6 percent growth); and “a thoroughgoing structural and institutional reform of the major problems” restraining the economy, from cleaning up banks and taking on SOEs to reducing corruption and strengthening governance generally (8-9 percent growth—the path Vietnam nominally seeks, and the rate other Asian economies have realized at a similar stage of development). In this sense, the Fulbright School scholars suggest that Vietnam’s future depends not only on sound policies, but on overhauling fundamental institutions. Rather than exercising economic leadership, “the state should only do what the private sector does not want or cannot do.” For private enterprise and agriculture to flourish, “a clear property-rights regime is…foundational.” Similarly, “citizen participation in exercising public power and in delegating power to the state is the foundation of the political legitimacy of any democratic regime”—and must be recognized in law. If the venue and timing surprised the faculty and students in Ho Chi Minh City, the essence of the prime minister’s message did not. Meanwhile, the Fulbright School is taking its own medicine: building its skills and aiming for a truly ambitious future. In the normal course of academic operations, the faculty continues to pursue deeper training, enabling it to address a changing Vietnam. For example, Le Thi Quynh Tram —an electrical engineer who had worked for Nortel in Canada—attended the school in 2007 to acquire training in applied economics, and then became a tutor and teaching fellow. Having completed her M.P.A. studies at Harvard in 2013, she is now Fulbright’s academic affairs manager and a full lecturer in four courses. And Huynh The Du—already a civil engineer, a 2002 FETP graduate, a 2010 Kennedy School M.P.A., and a faculty member since 2005—earned his D.Des. from the Graduate School of Design last May. Having previously done groundbreaking research on the limitations of Vietnam’s state-owned shipbuilding industry (the lead company went bankrupt in 2010) and on an ill-advised proposal for a national high-speed rail system (rejected by the National Assembly in the same year), he will return to the school this spring prepared to teach at a new level about Ho Chi Minh City’s growth and Vietnam’s rapid urbanization. After experiencing the characteristic “one-way lecturing” during his Vietnam schooling, Du says his FETP education was “the first time I had the opportunity to think and talk freely, to raise my arguments and to deal with professors equally”—a style he has brought to his own teaching, including advising several thesis students at home this year via weekly Skype conferences. Fulbright is also expanding its reach into pressing new areas—most prominently, melding its economic and public-policy teaching and research with a focus on the environment and sustainability. Rainer Assé, a Cornell-trained natural-resources Ph.D. who has worked in Africa and Asia during the past two decades, joined the school in January to direct a new Lower Mekong Public Policy Initiative. A component of a U.S. Agency for International Development-funded project spanning the Mekong region, the initiative focuses on the development-policy challenges posed by climate change, hydrology (irrigation, subsidence, salt-water intrusion), and other threats. Assé aims to work with local officials, the private sector, and others to “design and integrate economic policies that are ecologically and socially sustainable.” Given the school’s record, he says, he quickly found it “very well placed among local decisionmakers and high-level policymakers” to direct a productive policy conversation in the lower delta. As he does, consistent with the Vietnam Project’s origins, he will develop new courses for the Fulbright curriculum, broadening its policy reach while taking the first steps toward introducing scientific and engineering content into its educational offerings. That last detail may, in time, be the most telling. For Fulbright is now pursuing the largest leap in its unlikely 20-year history: transforming itself from a public-policy school with impeccable academic credentials into its country’s first private, nonprofit university, modeled on international standards. Even as it adds urban development, law and governance, and the environment to its curriculum, with faculty and research to match, Thanh says, the biggest contribution the Fulbright School can make is to create a larger, surrounding institution in which it thrives as the public-policy school. “The FETP structure works,” he says, “because we have the academic freedom and space to innovate”—a capacity that exists nowhere else in Vietnamese higher education. At a time when so much else in the country is being rethought, the proposal prompts “both excitement and fear in Hanoi,” where it is being reviewed, he says. Like the earlier certification of the M.P.P., a Fulbright University Vietnam poses novel issues in a system built on existing public universities, for-profit institutions offering business and foreign-language training, and some government-to-government joint ventures. To prepare for this metamorphosis, the school made important changes last year. The ebullient Thanh became its director, completing the transition to indigenous leadership. Ben Wilkinson, the Vietnam Program’s resident staff member, relocated to Cambridge—concluding 19 years of having an HKS representative on site in Ho Chi Minh City. And Thomas Vallely, completing a quarter-century as program director, relinquished that role to Wilkinson. (That signaled a generational shift, too: Wilkinson, born in 1975, when Americans fled their embassy in Saigon, came to Harvard determined to study Vietnam and its language; studied in Hanoi for a year as an undergraduate; and then worked with FETP and lived in the country for 10 years.) 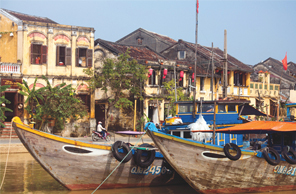 Vallely in turn assumed a new status, as the Ash Center’s senior adviser for mainland Southeast Asia; he and David Dapice continue to work on Vietnam, while deepening their involvement on a new frontier, Myanmar (see “Sowing Seeds,”  January-February, page 17). But Vallely has also broadened his portfolio, as chair of the Trust for University Innovation in Vietnam, the U.S.-based group that seeks public and private support in both countries for the proposed new institution and promises continued involvement in its governance as a guarantor of its academic freedom. (Other board members include Leon Botstein, president of Bard College, and Marshall Carter, retired chairman of the New York Stock Exchange.) Its prospectus envisions master’s-level programs in policy, business, finance, law, and engineering, with undergraduate liberal arts “in time.” One backer is John Kerry, now U.S. secretary of state. In a visit with the school’s leaders, faculty, and alumni during his trip to the country last December  (accompanied by Wilkinson as translator), Kerry pledged to work with Vietnam’s government to establish the university. That external support aside, Vietnamese considerations will determine whether the proposal proceeds. So it is bracing to hear what some of its advocates have to say. Tran Vu Hoai, M.B.A. ’94, who served as an early translator when Perkins, Vallely, and Dapice first engaged with officials in Vietnam and on the study tours abroad, recalls the “substantial, real, and intimate” basis on which the Americans’ early studies and advice were built, and the “very high level of trust” engendered as a result. He says that trust carried through the recruitment of students for scholarships, building capacity among young Vietnamese who might become “capable of running the country at a later stage.” (Hoai himself benefited, attending the business school as a Fulbright, then returning to his work as an intermediary for foreign businesses seeking to invest in Vietnam. 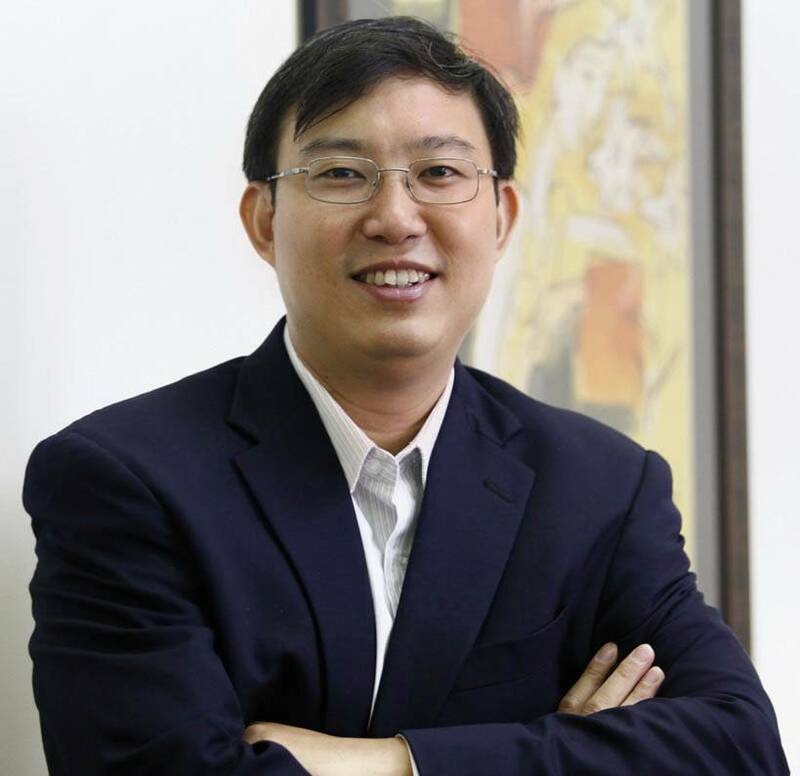 He has since built a consulting, advisory, and investment-banking firm working with foreign enterprises entering the market, and now is also Unilever’s senior corporate-relations officer for Vietnam.) Of FETP, Hoai says, “It’s a passion, a commitment” sustained by its founders for two decades, and “as a Vietnamese, I’m grateful for that” (a feeling strongly shared by the school’s alumni nationwide from the Mekong Delta to Hanoi). Now, with the economy slowed, he believes the country’s leaders “know the problem…and at least have the courage to discuss it among themselves and to try to solve it. My question is how brave they can be in addressing it.” At moments like these, “We need to have the right understanding” of the challenges, so “Vietnam has to go the university route.…We depend on educational institutions that provide the ability to have a vision” for Vietnam’s future. The solution to Vietnam’s contemporary dilemmas thus hinges in part on its decisions concerning the quality of its education. To an extent that no one in Cambridge or Ho Chi Minh City could have imagined 20 years ago, choosing success means building upon the Fulbright School’s unlikely role as a beacon of higher learning. John S. Rosenberg is editor of this magazine.